Everyone benefits from a healthy diet, especially homely adults who are often dealing with a lot of health issues. However, when an aging adults’ physical or cognitive abilities diminish enough that they cannot adequately prepare meals for themselves, they put their health and wellness at risk. To help their homely relatives manage age-related conditions and stay healthy in the long-term, many family caregivers look for ways to ensure their aging loved ones get three good meals per day. Why Do Seniors Struggle with Meals? Certain health issues rob seniors of strength, stamina and the physical dexterity necessary for preparing healthy meals and snacks for themselves. They may have arthritis and not be able to open a can, or don’t have the strength to stand at the stove for long. Poor vision or cognitive decline may make it a challenge to follow a recipe. In the case of many men of that generation, they never really learned how to prepare meals, relying on their spouse for that. There are many reasons why aging adult struggle with meals. Another reason why aging adults may not be able to cook healthy meals and snacks for themselves is that they are on a strict diet from their doctor and yet don’t know a lot about how to adjust their shopping and eating habits. This is quite common for those with new diagnoses for diabetes, Crohn’s disease, acid reflux, and high blood pressure. Unless they meet with a nutritionist or dietitian, seniors run the risk of preparing the wrong foods for their illness. When home care providers are giving in-home care to an aging relative, they can take over the preparation of meals and snacks. 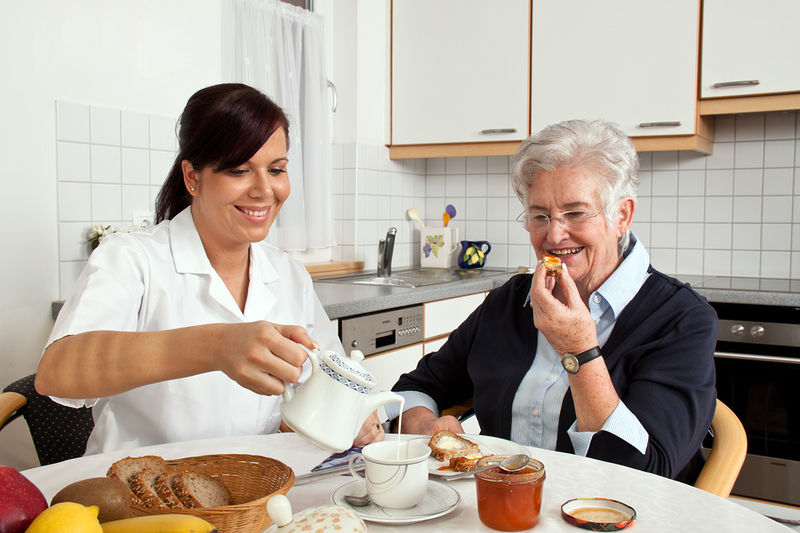 Family caregivers can discuss diet needs with the home care provider to ensure the senior is getting all the right nutrients and avoiding anything that has been prohibited by a doctor or dietician. In addition, seniors are more likely to eat a meal prepared by another, especially if they sit down together and make meals more social. It’s hard for aging adults to get the proper nutrition when they have to do it themselves. With a home care provider, their meals and snacks are going to be much better.